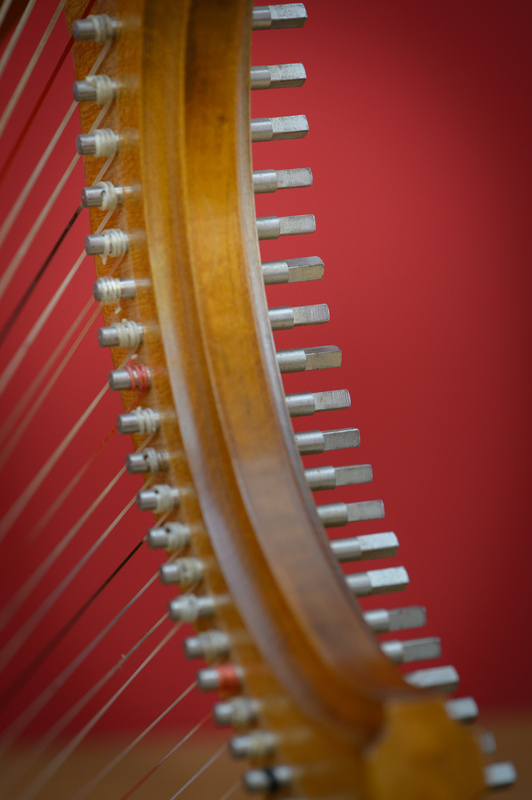 A typical example of a 15th or 16th century harp. 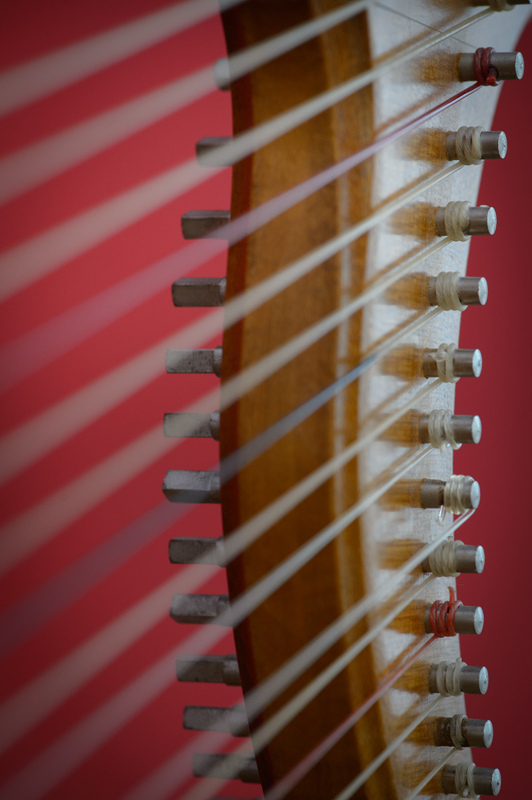 Around 1500 we find many illustrations of harps with a 'Gothic' outline, mostly on pictures of Dutch painters like Hans Memling, Hieronymus Bosch or Israel van Meckenem. Their common features are a longer string length, thin strings and bray-pins, that add enormous carrying power and a very characteristic sound to these instruments. The Gothic harp seems to set a standard for 200 years to come. On the German Wartburg castle is a mid 15th century instrument of the same type. Also very similar is a later harp in the GNM Nürnberg. About the bray-pin sound there is a very interesting quote in Michael Praetorius' entry on the Flemish Muselar type spinet. He mentions a stop of little brass plates that touch the strings to give the instrument a 'harp-like resonance'. Writing in 1619 it is totally normal to him to hear this sound. Today audiences seem very irritated -. 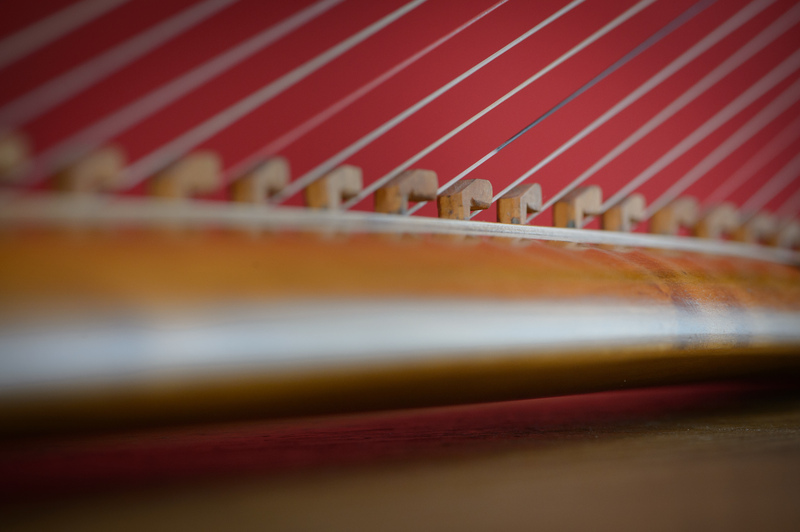 modern listeners expect a very different harp sound. What the bray-pins do the the sound, you can see on a great French website. This was my first historical harp and I still love it. My friends and teachers Judy Kadar and Cheryl Ann Fulton introduced me first to Rainer Thurau and his work. I think this model is his very best. I've strung it with b-flats and b-naturals in the higher octaves. The bray-pins I keep on all the time. Very fine balanced sound. My favorite music on it are the pieces from Codex Faenza from about 1460 but also the Italian dance music in Fabrito Caroso's dance book 'Nobilià di Dame' from 1600 works very well.